On Monday I wrote about Prague hosting a science conference where people played music with their brains. Today is another big day in the Czech Republic, but this one has roots much, much further in the past. Today, like April 30 every year, is Witches’ Night. Witches’ Night (Pálení čarodějnic in Czech) is sort of a cross between the First Day of Spring and Halloween. In practice, it’s not much more than an excuse for people to get together in the outdoors after a long winter and celebrate. And burn a fake witch on a bonfire. Sort of morbid, yes, but it’s all in good fun. Like many weird pagan rituals around the world, Witches’ Night has murky origins. The most commonly accepted story is that it’s a sort of hodge-podge of customs, descended from as far back as the Iron Age. Many align the festival with Beltane, an ancient holiday still celebrated on April 30 in Ireland, Scotland and the Isle of Man. People also link Witches’ Night to another April 30 holiday, the German and Scandivanian Walpurgis Night. And the name itself (Witches’ Night) probably comes from the witch trials that took place in these parts in the 16th and 17th centuries. Whatever the origins, it’s yet another example of a European tradition that brings folks together in merriment and appreciation of something or other (in this case, the onset of spring). Just in time for May Day. Prague is famous for its classical music concerts. But there was one last week that puts all others to shame, in my opinion. Because in this orchestra, the players don’t make music with instruments. They make music with their brains. It all sounds very science fictional, but it’s real. You can see for yourself. 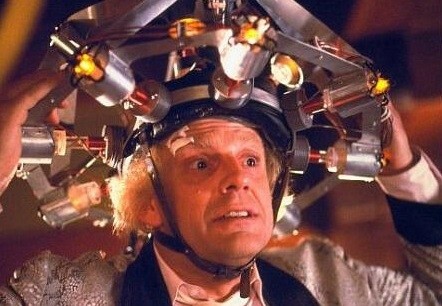 I won’t pretend to understand the science (this article gets into some of the details), but it involves electroencephalographs (EEG) and “orchestra” members wearing special hats mildly reminiscent of Doc Brown from Back to the Future. The world premiere of the brain orchestra was at the Science Beyond Fiction conference in Prague, where a group of Europeans came together last week to talk about cutting edge science. The orchestra, known as the Multimodal Brain Orchestra, uses the technology supplied by an organization called Synthetic Perceptive, Emotive and Cognitive Systems (SPECS). By the way, if you’re ever in Prague (which I highly recommend, having lived there for two years), I suggest going to a non-brain classical music concert in any of the random church courtyards that host them. It’s enchanting. I always thought summer started on or around June 21, and that was that. Apparently not. In Iceland, yesterday was the official First Day of Summer. Turns out that every year on the first Thursday after April 18, Icelanders celebrate sumardagurinn fyrsti, a public holiday where one and all come out of winter hibernation to welcome the new season. But with temps in the 40s, along with snow and rain, how can they call this summer? It all started back in the Viking days, when the Old Norse calendar divided the year into just two seasons: winter and summer (the beginning of the summer season was called Harpa). So, in homage to the Viking forbears, yesterday was summer in Iceland, cold temps or no cold temps. Icelanders celebrate with walks, games, parades and general enjoyment of the outdoors. But there's actually more at stake than just fun in the sun. In a tradition reminiscent of our Groundhog Day, Icelandic legend says that it will be a good summer to come if the seasons are “frozen together” (a nice twist of phrase that just means if there's an overnight frost before the big day). Easter traditions vary throughout the world, but perhaps there’s no more unique than what goes down on the Greek island of Chios. This past weekend, on the celebration of the Greek Orthodox Easter holiday, two ancient churches in the town of Vrodandos performed their annual Easter custom: they fired thousands of rockets at each other. Yes, during midnight mass on Saturday night, thousands of small rockets streamed through the night sky, landing (mostly harmlessly) on the two churches (and nearby buildings) even as people worshiped inside. Though it may look like war, it’s actually more like camaraderie, with the tradition dating back to the 19th century, when sailors off the island would fire their guns to celebrate Easter. Today, the rocket war has become a spectacle for tourists, who flock to the island from all over the world to witness it for themselves. If firing thousands of rockets sounds dangerous, well, it sort of is. There’s usually some damage done to buildings, and it’s not uncommon for there to be some injuries to townspeople. In fact, the practice is technically illegal, but after a couple centuries of tradition, the local police have no choice but to stand back and let the rockets fly. Shidaoxin is not your average Buddhist monk. No, this 26-year-old has found a unique way to bring the Buddha’s teachings to the masses: he records pop songs. Shidaoxin, who records his music in a Beijing studio, has released one album and two singles, and he’s becoming something of a worldwide phenomenon. He has appeared on Chinese TV and radio, and an internet presence has only increased his ranks of followers and fans. That said, to me Shidaoixin seems to be doing this for all the right reasons. Times change, and Shidaoxin assures everyone that in this modern age Buddhism has an opportunity to embrace new technology to spread its teachings. And he hopes his music will touch people’s souls, an important achievement in today’s modern secular cities. Further, the profits from his second album, due out this year, will go to charity. It’s known as the Ghost Chili, and it’s as scary as it sounds. As the subject of a world record broken in India yesterday, the world’s hottest chili (according to the official Scoville scale of chili pepper spiciness) is the talk-of-the-pepper-eating-town. Anandita Dutta Tamuly, a 26-year-old Indian woman, broke the Guinness World Record yesterday in Jorhat, by eating 51 ghost chilis in two minutes. Though Anandita said she “felt terrible” after achieving the feat, she is undoubtedly happy about having her name immortalized in the record books (though Guinness has yet to confirm the record). As far as the exact level of hotness we’re talking about, the Ghost Chili (more formally known as the Naga Jolokia) comes in at more than one million units on the Scoville scale. The next spiciest pepper, the Red Savina Habanero, is only about half that. And a standard green chili pepper has about 1,500 units. As you can see toward the end of this video of the event, Anandita not only ate the record-breaking chili peppers, she also followed that up by smearing hot chili seeds in her eyes. I don’t know about you, but that seems like a bit of grandstanding to me. That said, I am extremely impressed and would like to meet this woman in person. That’s right, people. Tomorrow is International Pillow Fight Day. If you need to relieve some stress, want an excuse to get together with friends and strangers, or just like hitting people with things, see if there’s a fight planned in your city and join the legions of pillow fighters around the globe in an afternoon of mayhem. Cities all over the world will be participating. Though a check on youtube and flickr turns up mostly Chicago, New York and Boston as Pillow Fight Day hotspots in years past, tomorrow looks to be a big, big day all over the world. Amsterdam, Belgrade, Melbourne, Krakow, Stockholm, São Paolo, and many, many others all seem ramped up for the event. If you’re wondering how these events play out, the organizers of Pillow Fight Day lay down some how-to tips and rules on their website. One example: if you’re considering running a pillow fight in your hometown, don’t ask for official permission from city officials. More than likely the request would be denied (yet no participant has ever been arrested in a don't-ask/don't-tell pillow fight.) Other guidelines include using soft pillows, swinging lightly, and not hitting people with cameras. The website notes that central town squares in European cities are ideal venues for big pillow fights. If you aren’t in Europe tomorrow, too bad. Maybe next year. In the meantime, perhaps you can get your feet wet in whatever city you’re in. And if you are in Europe, and happen to get involved in a pillow fight, let us know how it goes. And one more thing: Wash your pillow. Before and after.